Stars are often described as Diamonds in the sky and recent discoveries show that this is true. 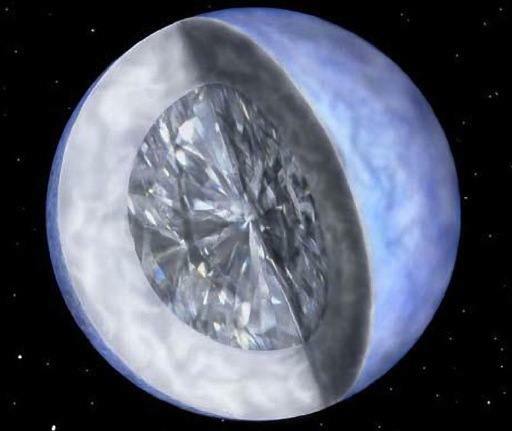 A white dwarf star, 50 light-years from Earth, has been discovered to be made of diamond. The cosmic diamond, as BBC News coined it, is a chunk of crystallized carbon and is the compressed heart of an old star that was big and bright but has since faded and shrunk. It is about 2,500 miles in diameter (bigger than the Earth’s moon which is only about 2,160 miles) and weighs 10 billion trillion trillion carats. The star has been named by astronomers as “Lucy” from the Beatles song, “Lucy in the Sky with Diamonds”. However, the dwarf’s official name is BPM 37093. Comparing it to the largest diamond found on earth, Star of Africa, Lucy’s Diamond is on a completely different scale. The Star of Africa weighs only 3,106-carat and it would only appear like dust if compared to Lucy. Steve Kawaler, Iowa State University professor of physics and astronomy, led a group of 50 scientists specializing in astronomy towards this discovery. To observe and monitor the dwarf star, the team used Whole Earth Telescope data as well as that captured by the Hubble Space Telescope. You might now be wondering how Lucy had that huge diamond core. According to scientists, main sequence stars burn their hydrogen, helium and other gases causing them to expand. During expansion, they are transformed into huge red giant stars but eventually, they lose their outer shell gases and only their hot core remains. The hot core now begins to cool down causing fusion reactions to create increasingly heavier elements. Eventually, all that remains is a tiny amount of oxygen and carbon, and according to theory, that’s when crystallization occurs. However, scientists have never been able to confirm this theory because there is no way to detect or study a crystallized dwarf star. During the start of the cooling phase, stars pulsate as they burn helium. These light and sound pulsations are detectable, but they cease once crystallization has occurred. Lucy is different. It is the biggest dwarf star scientists are aware of, and it is so large that crystallization of the core is starting even as pulsations are still occurring which are very crucial for Scientists since they can use this pulse data to analyze the interior of the dwarf star. They have determined that the core of this unique dwarf star is already crystallized, and they have even been able to measure this gigantic diamond. Based on the data collected, the astronomers believe Lucy has a blue-green tint. They base this assessment on the conclusion that the core of the dead dwarf star is largely composed of carbon and oxygen. Blue-green is the color diamond these constituents would be expected to produce. Lucy’s distance from Earth is very far and wouldn’t be possible to reach even today. It is said that our own Sun star will be like Lucy when it dies. But that will only happen after life here on Earth has perished. Don’t be too sad though. Who knows, maybe after a few years, scientists will discover a way on how to reach those isolated diamond stars.